More than 100 million Americans are over the age of 50 today, and while research concludes we can grow and enhance our lives at every age, stereotypes about aging still plague our society, contributing to the boredom, isolation, depression, and decline we often see in older clients. But don’t let the ominous perception of “aging” take control of your client’s life! 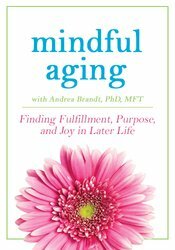 In this recording, you’ll gain insight and practical tools to help older clients find fulfillment and truly understand that “age is just a number.” Andrea Brandt will provide you with mindfulness-based strategies to help your clients get unstuck from their past and embrace the future of possibilities. In addition to this, she will help guide you into asking the life-altering questions that your clients fear to face. Watch this recording and take home strategies and techniques to use with your clients! Evaluate the efficacy of mindfulness-based practices to increase self-awareness and decrease reactivity in clients 50 and older. Articulate methods by which mindfulness-based approaches can be interfaced with psychotherapy practices to improve clinical outcomes. Explore strategies in a clinical setting to communicate and evaluate life-altering questions for clients 50 and older. Apply simple yet effective clinical interventions in session to help clients acquire a new perspective of aging and a more adaptive approach to managing feelings of loneliness and isolation. Point out the clinical implications of social connections to help promote client level of functioning. California Alcoholism & Drug Abuse Counselors: PESI, Inc. is an approved provider by the CCAPP-EI, Provider #: OS-03-036-1019. This self-study activity meets the qualifications for 5.0 CEH's (continuing education hours). Connecticut Addiction Counselors: Provider #120924. This course has been approved as a CCB approved training and has been awarded 5.0 hours by the Connecticut Certification Board. This intermediate self-study activity consists of 5.0 clock hours of continuing education instruction. Credit requirements and approvals vary per state board regulations. Please save the course outline, the certificate of completion you receive from the activity and contact your state board or organization to determine specific filing requirements. New York Counselors: PESI, Inc. is recognized by the New York State Education Department's (NYSED) State Board for Mental Health Practitioners as an approved provider of continuing education for Licensed Mental Health Counselors. #MHC-0033. This self-study activity will qualify for 6.0 contact hours. Full attendance is required; no partial credits will be offered for partial attendance. South Carolina Counselors, Marriage & Family Therapists and Psycho-Educational Specialists: This program has been approved for 5.0 continuing education hours by the South Carolina Board of Examiners for Licensure of Professional Counselors, Marriage and Family Therapists, and Psycho-Educational Specialists. Provider #4540. Texas Counselors: PESI, Inc. has been approved as a continuing education sponsor through the Texas State Board of Examiners of Professional Counselors. Provider #: 2477. This self-study course qualifies for 5.0 continuing education credits. This self-study activity consists of 5.0 clock hours of continuing education instruction. Credit requirements and approvals vary per state board regulations. Please save the course outline, the certificate of completion you receive from this self-study activity and contact your state board or organization to determine specific filing requirements. Illinois Marriage & Family Therapists: PESI, Inc. has been approved as a provider of continuing education by the State of Illinois, Department of Professional Regulation. Provider #: 168-000156. Full attendance at this self-study activity qualifies for 5.0 credits. New York Marriage & Family Therapists: PESI, Inc. is recognized by the New York State Education Department's (NYSED) State Board for Mental Health Practitioners as an approved provider of continuing education for Licensed Marriage and Family Therapists. #MFT-0024. This self-study activity will qualify for 6.0 contact hours. Full attendance is required; no partial credits will be offered for partial attendance. Texas Marriage & Family Therapists: PESI, Inc. has been approved as a continuing education sponsor through the Texas State Board of Examiners of Marriage and Family Therapists. Provider #: 503. This self-study activity qualifies for 5.0 continuing education credits. This intermediate activity consists of 5.0 clock hours of continuing education instruction. Credit requirements and approvals vary per state board regulations. Please contact your licensing board to determine if they accept programs or providers approved by other national or state licensing boards. A certificate of attendance will be awarded at the end of the program to participants who are in full attendance and who complete the program evaluation. California Nurses: PESI, Inc. is a provider approved by the California Board of Registered Nursing, Provider #:17118 for 5.0 self-study contact hours. Florida Nurses: PESI, Inc. is an approved provider by the Florida Board of Nursing. Provider #: FBN2858. These materials qualify for 5.0 self-study contact hours. Iowa Nurses: PESI, Inc. is an approved provider by the Iowa Board of Nursing. Provider #: 346. Nurses successfully completing these self-study materials will earn 5.0 self-study contact hours. This self-study activity consists of 5.0 clock hours of continuing education instruction. Credit requirements and approvals vary per state board regulations. Please save the course outline and the certificate of completion you receive from this self-study activity. Contact us for more information on your state board or organization specific filing requirements. American Psychological Association credits are not available. Florida Board of Psychology: PESI, Inc., is an approved provider with the Florida Board of Psychology. Provider Number 50-399. This product qualifies for 5.0 self-study continuing education credits. Please make sure to bring your license number to the seminar so that we can report your attendance to CE Brokers. California Social Workers/ Counselors/Marriage & Family Therapists/Licensed Educational Psychologists: This intermediate activity consists of 5.0 clock hours of continuing education instruction. Credit requirements and approvals vary per state board regulations. Please contact your licensing board to determine if they accept programs or providers approved by other national or state licensing boards. A certificate of attendance will be awarded at the end of the program to participants who are in full attendance and who complete the program evaluation. Colorado Social Workers: PESI, Inc. is an approved provider with the Colorado Chapter of the National Association of Social Workers. Provider #1413. This course has been approved for 5.0 continuing education hours. Florida Social Workers/Marriage & Family Therapists/Mental Health Counselors: PESI, Inc. is an approved provider with the Florida Board of Clinical Social Work, Marriage and Family Therapy and Mental Health Counseling. Provider Number 50-399. This self-study course qualifies for 5.0 continuing education credits. Illinois Social Workers: PESI, Inc. is an approved provider with the State of Illinois, Department of Professional Regulation. License #: 159-000154. Successful completion of this self-study activity qualifies for 5.0 contact hours. Kansas Social Workers: PESI, Inc. is an approved provider with the Kansas Behavioral Sciences Regulatory Board. Provider #14-006. This self-study course has been approved for 5.0 continuing education hours. Minnesota Social Workers: PESI, Inc. is an approved provider with the State of Minnesota, Board of Social Work. Provider #: CEP-140. This self-study course has been approved for 5.0 continuing education hours. A certificate will be issued upon successful completion of a post-test. New York Social Workers: PESI, Inc. is recognized by the New York State Education Department's (NYSED) State Board for Social Work as an approved provider of continuing education for licensed social workers #SW-0008. This self-study activity will qualify for 6.0 contact hours. Full attendance is required; no partial credits will be offered for partial attendance. Expires: December 31, 2020. Ohio Social Workers/Counselors/Marriage & Family Therapists: PESI, Inc. is an approved provider with the State of Ohio Counselor, Social Worker and Marriage & Family Therapist Board. Provider approval #: RCST071001. Successful completion of this self-study course meets the qualifications for 5.0 clock hours of continuing education credit. Pennsylvania Social Workers/Counselors/Marriage & Family Therapists: This intermediate activity consists of 5.0 clock hours of continuing education instruction. Credit requirements and approvals vary per state board regulations. Please contact your licensing board to determine if they accept programs or providers approved by other national or state licensing boards. A certificate of attendance will be awarded at the end of the program to participants who are in full attendance and who complete the program evaluation. Full attendance is required, variable credits may not be awarded per the Pennsylvania State Board. This self-study activity qualifies for 5.0 clock hours of instructional content as required by many national, state and local licensing boards and professional organizations. Retain your certificate of completion and contact your board or organization for specific filing requirements.